A Big First Night for the Nashville Berklee Jam! 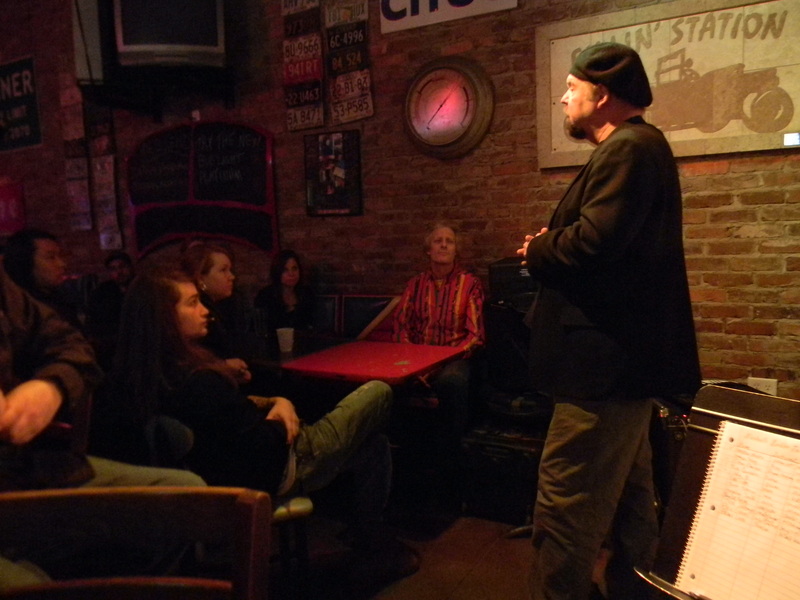 Last night’s “First Tuesday of the Month Nashville Berklee Jam” was a huge success! The otherwise quiet Nashville suburb of Kingston Springs came alive as the alums began filtering into The Fillin’ Station for this night of camaraderie and music. The mission of this monthly event is to help build our Berklee community in Nashville, and for the first hour, old friends reunited and new friendships formed over lively conversation in this quaint setting. Shortly after 8 pm I made a few brief announcements before introducing the night’s guest speaker, A-list session bassist, Mike Chapman. Mike’s talk centered on his lifelong career as a session player and he compared what he considers the key ingredients to being a successful studio musician to slices of a pizza. In talking about the support role that musicians play on a recording, Mike commented “there’s a big difference between something that is fun to play, and something that is fun to listen to”, noting that they are not always the same thing. He also added that “musicians, both live and in the studio, are essentially in the service industry, and it’s our job to provide the window dressing to the song or artist”. Another point he couldn’t drive home hard enough was how essential it is to know “The Nashville Number System”, as this is the main way songs are charted in Nashville, again, both live and in the studio, and the book bearing the same title by Chas Williams is a great way to learn. After Mike answered some questions from several alums it was time for some music. To get things started, I took the stage with our house band, consisting of Mike on bass and fellow alums, Heston Alley on Drums and Brian Lucas on Keys. We started out with a spirited version of Freddy King’s “Key to the Highway”, Paul Butterfield’s “Born in Chicago” (featuring bar owner, Patrick Weikenand on harp) and one of my favorites, “Ain’t Wasting Time No More”. Our next grouping featured Ted Schemp on guitar and vocals and Elton Charles, a recent arrival to Nashville, on drums, and we played one of Ted’s originals followed by an instrumental blues jam. 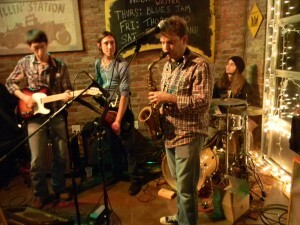 Sofia D got up and played some funky drums behind George Wong on bass and Ben Graves on guitar and vocals. Ben led us through a cool version of the Sam Cooke classic “Cupid” before Sarah Tollerson, host of another Alumni event, “Strength in Numbers” (held on the second Wednesday of each month at the Riverfront Tavern in downtown Nashville) joined us to sing “Oh Darlin’” and “You Make Me Feel like a Natural Woman”. Michelle Lambert, another recent newcomer, brought charts for a couple of originals and delivered some emotive vocals interspersed with some fine fiddle playing to a couple of arrangements on the fly. Bassist, Keiffer Infantino got into the mix with another recent arrival, guitarist Rick Carrizales, and at this point Ben Graves came back up to play some sax. We played a funky jam in A minor and everybody got to stretch out before our final tune of “Freddy the Freeloader”, for which Mike Chapman got back up to finish the night. If there’s one thing I have learned from all of the alumni events I have attended, it would be that Berklee alums are some of the nicest people you’ll ever meet. And that open, warm feeling was evident in both the conversations and music that took place on this cold February night. I would also add enthusiasm to this list of traits, as there was an infectious, electricity in the air during these performances. This jam was our first of many to come, as this will be held on the first Tuesday of each month, and the Nashville Berklee Jam website will serve to keep alums informed about future jams and all of the upcoming Nashville alumni events. 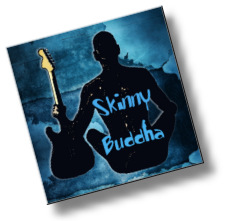 I would also like to encourage interactivity on this site, so don’t be afraid to post, comments, songs you would like to play or any other ideas you may have. On that note, I’m looking for volunteers to take photos and possibly shoot a few video clips of our next jam for future blogs. Thanks again to all those who participated in making this night a great success and see y’all at the next one! 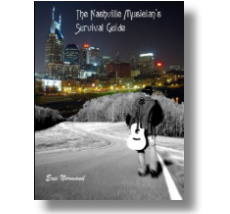 For those who are new to Nashville, or considering relocating to Music City, my book “The Nashville Musician’s Survival Guide” is a street level perspective of the music related jobs found here, and the ultimate companion for today’s musicians, songwriters and artists. Decades worth of information learned on the streets of Nashville for $20! How can you go wrong? This past week in Nashville brought some new experiences to the table for me, and today I would like to share a few quick thoughts on these events. 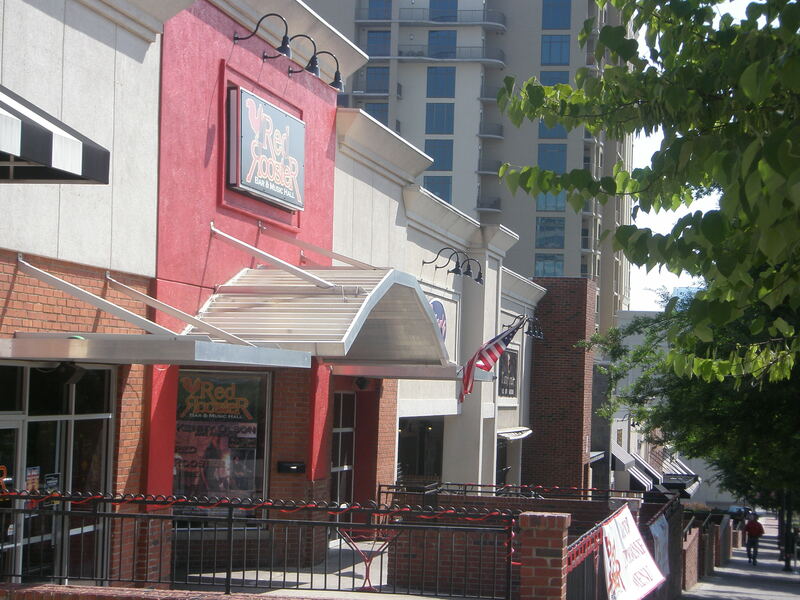 There is a Nashville-based music industry organization called “Indie Connect,” and once a month they have a “New to Nashville” meeting at The Red Rooster. I first discovered this organization last year when I stumbled across their website, a fairly elaborate site with all sorts of interesting and useful articles. Upon signing up for their newsletter I began to receive notifications about different meetings and workshops held monthly, themes ranging from “New to Nashville” to Songwriting, and “Singing in the Studio ” to PR Campaigns. While I’m certainly not new to Nashville, I have wanted to check out these meetings for a while as I have been asked to be a guest speaker at one of their luncheons next month. The meeting, hosted by longtime Nashville songwriter Marc-Allen Barnette, was very laid back and began with each person in attendance sharing a little bit about their background, as well as their Nashville goals. After the introductions Marc began sharing his thoughts and views about being a songwriter in Nashville as well as some other perspectives about the scene. Several valid points were made regarding songwriter nights. Most of the accompaniment at the songwriter nights is done with acoustic guitar, so if you are a songwriter and plan on participating, it is to your benefit to be able to play acoustic guitar (or bring someone else who can). Most songwriters in Nashville write with co-writers, as cowriting expands the number of contacts who are connected to their songs. Support the songwriting community. 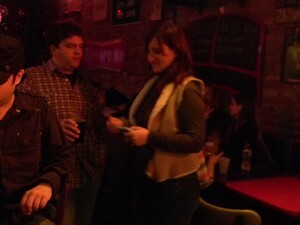 If you’re performing at a writers round, stick around after your song is done to show support for the other writers. Have you ever listened to the music of Ted Nugent? I have. I used to love hearing his song “Stranglehold” as it blared out of FM radios during my teenage years, back in the 80s. As distinctive as the guitar parts are to that song, the vocals are almost even more mesmerizing – a high and emotive rock and roll lyric belted out with power and conviction, by a distinctive and colorful voice. So maybe that’s why during our “New to Nashville” meeting on the outside patio of The Red Rooster last week it became difficult to focus on the discussion after the band began playing. Little did I know at that moment that the voice in the band that was booming out onto the patio was none other than that of Ted’s original lead singer, Derek St. Holmes. As I would later learn after the meeting let out, Derek lives in Nashville, and when he’s not on the road with Nugent, he can be found performing on Tuesday nights from 7 to 9 at The Red Rooster on Demonbreun Street. Even though I couldn’t see the band from where we were sitting on the club’s outside patio, I knew they were quite good from the moment they began playing. By the time they performed a blistering version of Jimi Hendrix’s “Red House” midway through the set it was obvious that this was not your typical Nashville bar-band. As I was firmly committed to the conversations at hand, I did my best to not be sidetracked by the music. But by the time they played the last song of their first set, which just happened to be the anthem “Stranglehold,” it was almost impossible to not become completely drawn in. This music is rock ‘n roll at its finest, and their performance was fit for a stadium crowd, let alone the 30 or 40 Nashvillians that had gathered on this cool spring night! I left during their break as I already had commitments elsewhere, but as this is a regular Tuesday outing for this rock ‘n roll legend and his band, I’ll be back for sure. Later on the next day, another significance of the Derek St. Holmes show occurred to me. The folks at this “New to Nashville” meeting were just that, new to Nashville. And the one thing most Nashville newcomers are lacking is contacts. The only reason I knew Derek St. Holmes was the performer inside was because I asked, mostly out of curiosity because it was so good. There were obviously some heavy hitters in his band too, all whom are likely connected to many other important avenues within the Nashville music industry and beyond. I recognized some players that work for national acts in the audience as well. Hey everybody, I realize that I haven’t been writing very many blogs over the past couple of months and I feel like I owe y’all a few. This lack of regular blogging is mostly because of the frantic pace I kept while trying to finish the book. I’m going to do my best to put out a new blog everyday (or so) for a while. When I first moved to Nashville, back in the summer of 2002, I was hungry for work. But gigs, especially gigs that paid well, seemed few and far between. My mentor and friend, “D” gave me tons of good advice, including networking on the town as often as I could. I followed this advice, going out on the town four or five nights a week, taking every oddball gig that was offered, sitting in whenever I could, etc. After six months of this routine, although I was making a lot of friends and connections, I still didn’t have any consistent gigs that paid any real money to speak of. His response was quite simple, although I wouldn’t entirely comprehend the entirety of it for a couple of years. Although that last statement was probably the most important thing he said during our conversation, the things that I heard the loudest were “This town goes at its own speed,” and “five years.” Geeesh! The Nashville music scene goes in slow motion, and I have to wait five years to get busy – NOT exactly what I wanted to hear! But looking back at that moment, now going on 10 years into my Nashville life, those telling words make so much sense. I met a lot of people during that first hard year of Nashville – musicians, engineers, songwriters, artists, etc. – and became friends with many of them. In the years that followed, many of these friends and acquaintances would eventually call me for work. Sometimes it was a simple “one-off” gig, other times it was several gigs, sometimes it was songwriter demos. In 2006 I did a ton of gigs on Broadway, mostly at Tootsies, but also at The Stage and a few other clubs on the strip. It was good supplemental income, good for my chops, and I met and gigged with several great players whom I became good friends with in the years that followed. These gigs all started with one phone call from a guitar player friend I had met during my first couple of months in town. He subbed out a few gigs to me, these gigs led to more gigs, and before I knew it I had all the work I could handle on the strip – All because of one relationship. Several years later I was working more as a touring musician and no longer gigging regularly downtown. On many occasions I found myself in need of musicians for different situations, and ended up calling players I had met during those earlier years of steady gigging on Broadway. Sometimes I would need a player last minute and call someone I hadn’t even spoken to for a couple of years, someone that had obviously made a good impression at an earlier point in time. As some of you may know, and for those of you who don’t know, I have just released my book “The Nashville Musician’s Survival Guide.” This street-level perspective of the music-related jobs in the Nashville music industry is now available in print version, and the e-book will be available within a few days. To purchase your own copy, follow this link.